Check out @lcfremont's interview with Cut Shoot Kill director Michael Walker (@lcfremont's review can be found here). Writer/director Michael Walker, has just unleashed his first foray into horror and it’s a wonderfully fun and thought provoking entry. 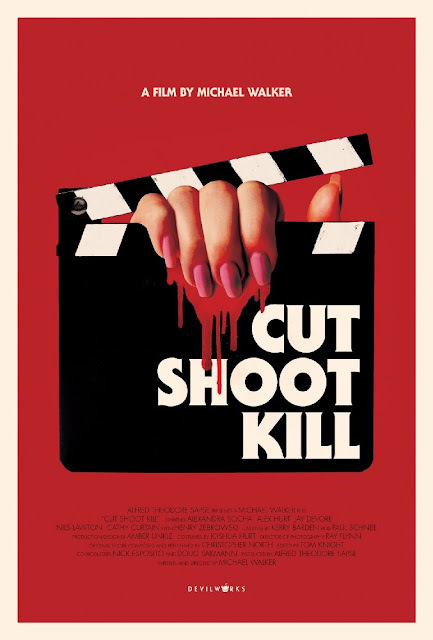 Cut Shoot Kill asks the questions that can plague a horror fan, namely, “What are the people behind the camera thinking?” Mr. Walker recently took time to talk about these questions and a lot more in a fun and candid interview. LF: I noticed that a lot of your other projects were psychological thrillers; I recently watched The Maid’s Room and it was bleak, it was good and it was strangely prophetic, if I can say that without being too topical. Why did you transition from that to horror? MW: I always liked horror movies and I wasn’t a horror geek, necessarily, but I always liked horror movies. The first film I did had a little bit of horror elements in it and that got me into these genre festivals and I got into that world a little bit more and saw how serious they take their films and just films in general. I started to like and have an appreciation for more horror films more than I did before and, at the same time, movies that weren’t horror films became more generic. As far as cinema style goes, horror movies are really…there weren’t a lot of places that there was a lot of style besides horror and I was more and more drawn into that. And I did the psychological thriller because I didn’t want to do anything with monsters or anything like that. I think Cut Shoot Kill was a reaction to how The Maid’s Room was definitely trying to say some things and be a little different and I don’t think it came off or a lot of people didn’t like it that much, so I thought I’d do something a little more straight forward. LF:That’s interesting. So, you felt the horror fan base was more passionate? MW: They care more. Actually, there’s a line in Cut Shoot Kill about it. Serena doesn’t like horror movies and Shipman does and there’s a snobbery: he goes on to say that horror people are more passionate about movies than a lot of other movie people. They’re more open to seeing different things: that was my take on it anyway. LF: That was your take away with your first film on the festival circuit? MW: No, like I said, I was into horror movies already. I liked other movies too, but the world of horror fans sort of drew me in. I got more involved with horror fans. LF: We definitely are a different bunch, but in a good way. MW: I think so too and what I like about them is, generally, they start off as horror fans, but as they get a little older, maybe they get a little tired of horror films, but then they get into every kind of film and, generally, they know everything about movies and it’s hard to keep up sometimes with conversations with them. LF: That’s what I found interesting with your trajectory. Usually, horror is one of the first things people do. You didn’t and when you went to it, you owned it. Without giving away plot details, where did you get the idea for Cut Shoot Kill? MW: It’s hard to say exactly. There were a few things. Watching on the internet, sort-of real life death films where people really die and there are these other sorts of films where they purport themselves to be real when they’re not and then there’s sort of a combination in thereof, “Who would make these films?” They seem to be made semi-professionally, or at least they’re made with passion. I mean, they’re sicko films and they’re not real, so thinking about that started making me think about the film crew. Usually, those films are kind of badly made and cheaply made and doing something sort of mainstream in their style, but still have some real deaths in them. Once I started to come up with the characters who would make that sort of film, that’s when I started to have fun with it; the idea for making the sort of fun crew that was trying to achieve some sort of higher art. LF: It’s true that those movies are usually low budget and they put all of the money, it seems, into the effects so you believe you’re watching a real snuff film. And sometimes you do wonder if you actually are. MW: I always wondered who would do those films. There’s a crew behind them and there’s no money to be made, really, there doesn’t seem to be, so they just go into the woods and they have fun doing them, I guess. LF: In Cut Shoot Kill, you place the onus for these types of movies on the money man. MW: The money man allows them to take it to the next level. I would love to do the prequel of how Nicole and Alabama started making these movies and how they became more real as they went along, but once they got Shipman (the money man) involved, they really made a deal with the devil. LF: Shipman was perfectly slimy. MW: Yeah, he’s a great actor, Henry (Zebrowski) is a funny guy. LF: You got lucky with all of the actors, especially Alex and Alexandra. Did you have a difficult time finding the right actors? MW: Yeah, definitely. It was all done through auditions and at this budget level, we had a hard time getting agents to respond. Luckily, we had a really reputable casting director, so we were able to get a few people in. Also, Alex is a great theatre actor; it was surprising he hasn't done more films. And Alexandra is young, but she’s done some big things on Broadway and this is her first film, too, and I’m amazed that she carried it the way that she did. It’s not just being a good actress. Carrying a film is a hard thing to do. LF: She walks that line of being a diva, but I don’t totally hate her at the same time. MW: Yeah, I was worried about that. There is something a little bit hateable about her, but it’s part of the fun. If you go along with it. It’s the fun of her character. LF: She wouldn’t have had that much gumption if she wasn’t a little fiery and then it wouldn’t have worked. MW: That’s the way actors are on set. A good actor will claim their space. Crews are very sort of macho and actors can kind of come across as a little bit strange, but still need to do their work, so there can be this tension between the two. The lighting people and the set people, they have all of their time to set up their shots and as soon as the actors come on, the actors are expected to get it in five seconds; so an actor sometimes has to claim their space and make everybody listen to their process which can come across as a little strange, but it helps them and gets them where they need to be. It’s fun to watch that on a set. LF: It was fun to watch Serena and Alabama’s relationship. I feel like we got to watch both the characters and the actors relationship blossom. She was so unimpressed to be on a horror film, but towards the end, their relationship is very interesting. MW: I think a lot of the actors would say that. LF: You know, I watch so many low budget films and sometimes it’s so blatantly obvious that nobody knew each other, or they didn’t get along or nobody was having fun. I felt like we were able to go through this entire process with everybody on this film. MW: That’s nice. I’m glad that came across. It was very intense making it, but it was also a lot of fun making it and I hope that came across in the film; you always hope a little bit of that atmosphere comes through. You know, I always think of Rebecca (Faulkenberry). Rebecca played Nicole and she had never done an action scene or anything like that and she just had the best time doing it. Whatever preconceived notions people have about a horror film, they’re actually really fun to make for an actor because they run around and they get stabbed or they stab and they do all of these fun things. It’s very physical and I think, generally, actors on an indie film would just be talking to each other a lot and this definitely changes that up. LF: Do you feel you come up against that a lot? People having negative ideas about horror movies? MW: Well, this is the first straight up horror film that I’ve done. It was more the budget that people were scared of or snobby about, but I definitely see it. When I tell people that I’m making a horror film, they say, “Oh I can’t watch that.” Generally, with my friends, there is a lot of people who won't watch it just because it’s a horror movie. LF: Going back to what you said about loving to do a prequel, the ending left the option for a sequel and now I want both. MW: I’d love to do a lot. I love the characters in the film crew and I don’t think there was enough time in the film to really explore each one. I’d love to have the Nicole and Alabama meeting. There was a scene that we couldn’t shoot that was sort of a flashback of when they met. He talks about it, actually, in the film. Soundie and Shooter and the other crew members, how they came to be and where they’re from, I think that would be a lot of fun. I love those characters and I don’t think they got enough screen time. LF: No, they didn’t. I had so many questions about their backgrounds. You brought so much to it and I think that is what I really appreciated. On the surface it’s a horror movie, but it’s also a lot more. I kept thinking about it and I had all of these questions and I became strangely invested in Alabama towards the end, which I felt very conflicted by. MW: I think that’s what happens. No matter how bad a movie is that you work on, you generally get caught up in the excitement of making them and you think they’re really great and it becomes hard to tell if they really are or not. Really, even when you’re finished, you start to lose perspective on it and I think that’s the thing with Alabama. You get caught up in his vision or excitement of it. There’s a tension there: he’s not just gratuitously killing people. LF: No, he almost makes you feel like he’s doing something important. MW: Those characters from the south, I just think they’re so much fun and there were just too many to get too involved with the crew. LF: Previously, you were speaking about The Maid's Room and the way that, maybe, it didn’t get interpreted the way you had hoped for and that, in a round about way, led to Cut Shoot Kill? MW: In a way. The Maid's Room was very high minded and had a lot of… it’s hard to explain. I tried to do a lot of things with it. Not just say something, but say it in an interesting way and I tried to add this sort of style to it and I think the style might have come off wrong with some people. I know it is a dark film and people hate the ending, but outside of that, it’s hard for me to watch it and understand why it didn’t come off. I just wanted to do something that was a little more fun. Because at the time, I thought The Maid's Room and the characters in it were very fun, but it just came off as dark. LF: Yeah, no, I didn’t get fun from it at all. I liked the ending, though. I don’t see how it could have been any other way. LF: Do you have future projects set up already? MW: I’m doing a tv show. I’ve done the pilot for it, so we’ll see how that goes. It’s not a horror thing; it’s actually a comedy about three young artists in Brooklyn who are trying to make it in the art world. It’s called Paint. LF: Do you hope to do horror again in the future? MW: Yeah, I love horror films. Well, there’s a certain kind of horror film that I like. I don’t like supernatural things, really. I wasn’t raised religiously so I don’t have any fear of the devil or anything like that. I love ghost stories. One of the reasons that Chasing Sleep fit into that sort of horror thing is because it was a ghost story where you didn’t see the ghost and I tried to do that with The Maid's Room too. Where you just sort of see what’s left of a person without really seeing them. I always thought that was really interesting. I think ghost stories in a way, they’re about people living on, how they still exist in your head and how that is in the real world. Those sort of things interest me. I love horror and I love suspense. I actually, don't even think Cut Shoot Kill is too much of a horror film. It’s more of a thriller about a horror film. LF: Your other film is a comedy, correct? MW: Yeah, a workplace comedy. LF: I find that horror and comedy tend to cross genres a lot, so that makes sense. MW: I think the best movies have some humor in them. One of the things I hate about indie movies, generally, is that they all take themselves so seriously. LF: So seriously! That’s what I loved about your film. MW: In Cut Shoot Kill, there’s a film in there about snuff films and there is sort of a Michael Haneke movie that could have been made with Cut Shoot Kill, but I definitely wanted it to be fun and not a gruesome, horrible movie. LF: I found it to be a lot of fun and I really appreciate you taking the time to talk to me about it.